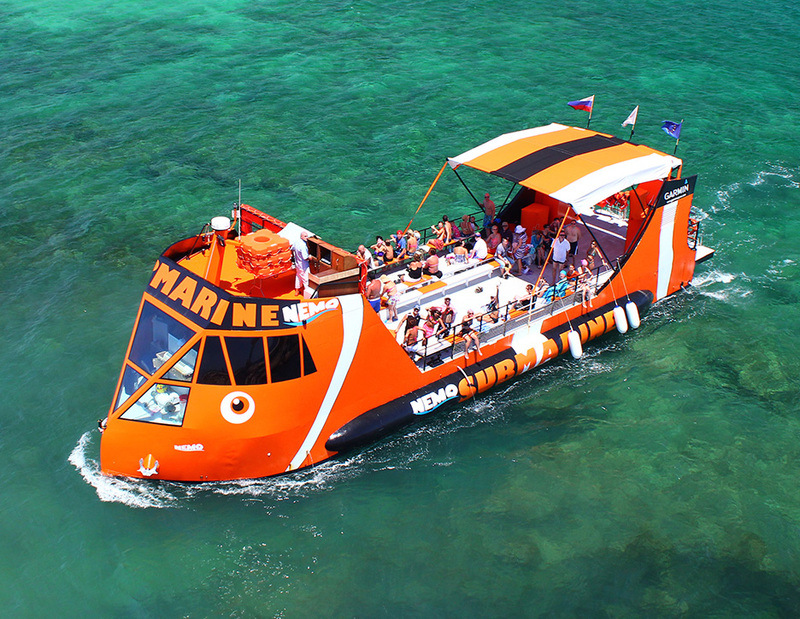 Board the Nemo and take a fun cruise along the Ayia Napa coastline. There are plenty of opportunities to entertain the whole family, including music and balloon sculptures for the little ones, the fully air conditioned lower deck of the boat, gazing out the viewing windows at the incredible underwater world. With 2 air-conditioned chambers and large viewing windows for an underwater view, the Nemo is the perfect boat for sightseeing along the Ayia Napa coast. Observe the marine life while cruising along the east coast, or just relax while enjoying the beauty of the Mediterranean sea. During the cruise, children are entertained by a DJ and animator, letting them take part in the creation of balloon sculptures, magic tricks, and music. Watch experienced divers feed fish in an entertaining highlight of the cruise. Get the chance to go for a swim in the crystal-clear waters of the Mediterranean before returning to Ayia Napa harbor. Afternoon: 14:30 - 16:30h. Boarding doors open: 14:15h. You can book your trip online here or via our representatives at the harbour - at the Nemo Submarine station clearly marked with the boat logo. Your ticket includes the trip - 2 hours on the submarine. The price of your ticket DOES NOT include any additional services, such as food or beverages purchased on board; hotel pickup and drop-off; rented equipment on board the boat. Children aged up to 3 travel for free. Check-in is 15 minutes prior to the start time of the trip. We advise that you arrive at least 30 minutes before the trip start time. If you have any sea / motion sickness do make sure you take your pill at least an hour before departure. Also, please ask the crew before boarding if the weather would allow you to enjoy your trip. You may be advised to not board the boat – please use your ticket for another trip. The laws forbid us from selling any medication aboard. You can take sea / motion sickness medicines from any pharmacy on the island. Note you need to take your medication at least 40 minutes before the trip starts. We do not allow people who are obviously under the influence of alcohol or any other substance altering your consciousness. Make sure you have your towel, cash and sunscreen with you. Please note we may not be able to accommodate your individual needs when we are in open sea - i.e. go back to the harbour or get you out of the boat after the trip has started. Nemo Submarine reserves the right to cancel service due to unforeseeable circumstances such as storms, heavy winds, etc. Our team cannot be held responsible for any damages or losses outside of our control. Fishing during the trips is strictly prohibited. All Tickets are Transferable but Non Refundable: You can use your ticket at any given date. For more information, please feel free to contact us via phone, email or the contact form herein.